Well looky here, the much-rumoured Google Nexus 4 has finally been announced by LG, but those hoping for an upgraded handset will be sorely disappointed. It was hoped that the white Nexus 4 may pop up with a newer version of Google's operating system, with reports suggesting it may be running Android 4.3, but alas it's stuck on the same Android 4.2.2 as its black brother. On the plus side you shouldn't have too long to wait to get your mitts on it, with the white Nexus 4 hitting shelves in Hong Kong on May 29, while the likes of Asia, North America, Europe and the Middle East following in the next few weeks. We just hope LG has its production sorted out. 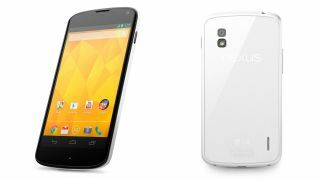 While you wait for the white LG Nexus 4 to land in a store near you, check out some of our colour-neutral blips. Is that an iWatch in Apple's latest advert?